For many people, ketchup is the ultimate sauce, and it’s easy to see why. You can eat it on meatloaf, hash browns, chicken nuggets, grits, and of course, French fries. On top of those particular foods, there’re also scrambled eggs, spaghetti, brass, and stainless steel… oops. Sorry about those last two, but don’t worry, we’ll explain them in a bit. Despite how odd it may sound, you can indeed put ketchup on brass and stainless steel and achieve satisfactory results. Sure, you can’t eat them, but with how clean they’ll turn out after you slap some ketchup on them, you probably won’t be too bothered by that. And while we’re on the subject of cleaning with ketchup, you should know that you can use it for so many things. Seriously, ketchup is much more versatile than you probably realize! Before we get into the specific things that you can use this condiment for, let’s first go over the “why” behind ketchup’s cleaning prowess. 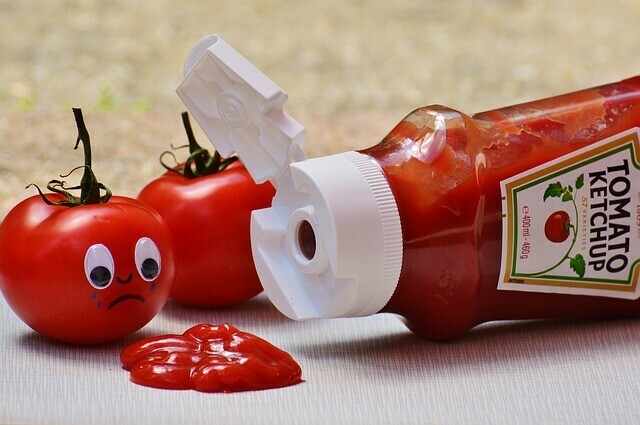 The reason ketchup can clean as well as it does is (of course) thanks to our buddies, vinegar and citric acid. The acetic acid inside of the vinegar combined with the citric acid inside of the tomatoes works as a pretty effective cleaner which is capable of cutting through dirt, grime, and dullness rather well. The best thing about it is that not only is buying ketchup already cheaper than any traditional cleaner, but you don’t even have to buy a specific brand. You’re good to go as long as the kind you buy has vinegar as an ingredient. Just like many other kinds of metals are often inclined to do, brass can become dull and lifeless looking. If you’re looking forward to revitalizing whatever brass things you have around your home you can apply ketchup onto the object with a paper towel and let it sit for about 40 minutes. After you’ve done that, you can rinse and wipe the object off. The term “stainless steel” is pretty misleading, don’t you think? All those water spots that appear every so often on stainless steel appliances would seem to disagree with the validity of that name. If you want to make your steel utensils and appliances look like new again, next squeeze some ketchup on a soft cloth and get to polishing. Rinse the item with a damp cloth and afterward buff dry. We may be coming off as a bit redundant at this point, but let’s face it, nothing made of metal stays pretty forever. Just like with brass and stainless steel, you can slather the condiment onto the silverware, wipe it off, and then rinse. An additional tip that we have to offer is that might want to use a toothbrush for those pieces with fine details so that you can get into all of its grooves. Burned-on food seems pretty hard to avoid from happening. Unless you’ve got some non-stick pots, odds are that you’ve got a stuck-on mess to contend with after dinner. To get rid of this hated enemy of dishwashers everywhere, slather the surface with ketchup and let it sit overnight. Once you’ve done that, rinse and voila! The burnt-on mess is gone. Like pretty much everything else in life, car wax costs money. That’s not to say that ketchup doesn’t, but the point we’re trying to make is that it costs less than car wax. After you’re done washing your car, you can put some ketchup on a soft cloth and rub your car down with it to get it looking nice and shiny. It’s OK. You can admit it, there are far too many of us that save those little packets of condiments from every time we have takeout. Sure you can use them when your bottled ketchup runs low, but there is also the option of freezing them. They don’t completely harden like water would so you can use these little ketchup packets as mini ice packs. They can help to sooth away any pain from whatever little injuries you or your children sustain. Granted, this one doesn’t really count as cleaning, but it’s still a pretty useful trick. Granted, there are other foods that can help you get better hair (avocados), but ketchup can do the trick as well. The sauce acts as a conditioner and can replenish your hair’s natural oils. All you need to do is rub it into your hair, let it sit for 20 minutes or so, then wash it out. As a bonus to all the blond swimmers out there, ketchup is also food for getting out that slightly greenish hue that your hair can turn due to the chlorine. To repair the damage, all you need to do is wash your hair like normal and then put some ketchup in your hair. After five minutes, you can rinse it out.